Proud Lake is a 4,700-acre state recreation area in the southwest corner of Oakland County whose terrain ranges from rolling dense forests and vast wetlands to a chain of lakes and 3.5 miles of the Huron River. Practically on the doorstep of Milford, Proud Lake draws a good number of hikers along with paddlers, campers, cross country skiers in the winter when snow is sufficient and even fly fishermen in the spring who arrive for a special catch-release trout season. 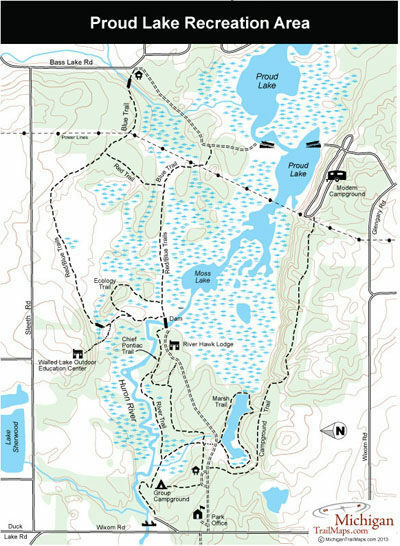 The heart of the park, and all its hiking trails, extends from Proud Lake west along the Huron River valley to Wixom Road. From Wixom Road, a dirt access road heads east to the park headquarters, main trailhead, group campsite and the Red Hawk Conference Center. West of Wixom Road is almost 9 miles of equestrian trails that is also open to mountain bikers. But mountain bikers are ban from the trails east of Wixom, an 11-mile system that winds along the Huron River and through the park’s extensive wetlands. This is by far the most interesting section of the park and the trails are well maintained with boardwalks and bridges that allow you to enjoy the area any time of the year without worrying about excessive mud. As to be expected, spring, particularly late April, is the best time to arrive and watch the marshes come alive with wildflowers, including hepatica, marigold and violets, while hiking to a chorus of spring peppers. Trail names can be a bit confusing here as you will see River Trail and Chief Pontiac Trail being used as well as a system of colors – blue, red, green and orange – marking the various paths. Nothing seems to correlate to the maps handed out at the park office or from the DNR website. River Trail/Blue Trail is used here to describe the longest hike in the park, a 5.75-mile loop that will lead you from Wixom Road to Bass Lake Road and back again. It can be easily shortened in numerous ways. 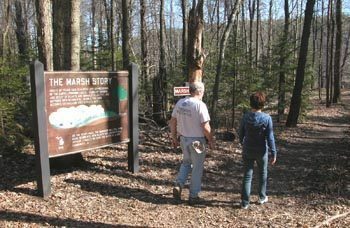 For young children, the best hikes is either the 1.25 mile Marsh Trail or the Chief Pontiac Trail that makes for a 1.5-mile round-trip to the dam at Moss Lake. Both of these trails are easy, interesting and feature a series of interpretive plaques. West of Wixom Road and north of the headquarters is Powers Beach, a small sandy beach and pond that was made by impounding the Huron River. There is a picnic area at Powers Beach with rental shelters. The park has a modern campground with 130 sites situated on an open bluff, from which there is a good view of Proud Lake throughout the camp ground. Facilities include two mini-cabins for rent and a separate beach and boat launch for campers. The campground is reached east from Wixom Road on Glengary Road and is well posted. There are no rustic sites at Proud Lake, but there is an organization camp. Canoeing is a popular activity during the summer along the Huron River with many canoeists paddling from near Powers Beach to Kent Lake, a three to four-hour trip. Heavner Canoe Rental (248-685-2379; www.heavnercanoe.com) operates a canoe and kayak concession in the park across from Powers Beach and accessed by Garden Road, which departs west from Wixom Road. The livery also provides pick-up service to a number of locations along the river. 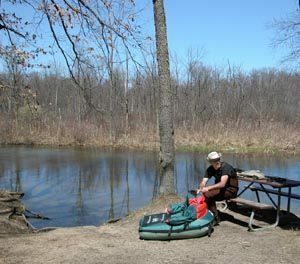 The recreation area is just east of Milford or 12 miles southwest of Pontiac and is reached from I-96 by taking the Wixom Road exit and heading north or from M-59 by turning south on Duck Lake Road. For more information contact the park office (248-685-2433). 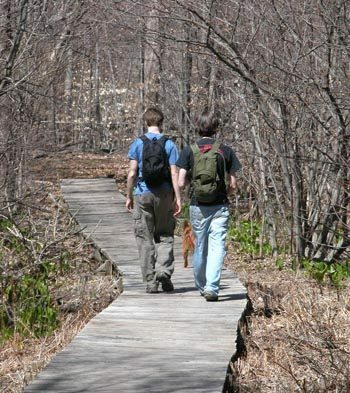 You can reserve campsites or a mini-cabin through the Michigan State Park Central Reservation Service (800-44-PARKS; www.midnrreservations.com) or find out about upcoming events, including hikes and interpretive walks from Friends of Proud Lake (www.FriendsOfProudLake.org).